How can I contact allheart? Ordering from allheart is simple, easy, and secure. Simply select the color, size, personalization options (if applicable), and the quantity then click the "Add to Cart" button on the product detail page. The Shopping Cart page will then display the items in your cart and will allow you to change the quantity of each item you've selected or remove items. From the Shopping Cart page, you can either proceed to checkout or continue shopping. When you have finished shopping, click on the shopping cart icon at the top-right of the page to review your selections. When you are satisfied with your order, click the "Proceed to Checkout" icon to complete your purchase. Note: If you experience any problems with items disappearing from your shopping cart, make sure you have Cookies enabled in your web browser. How can I place a group order? Just contact Customer Service at 1-800-372-2201, Monday through Friday between 9am and 9pm ET, or Saturday between 9am and 5pm ET. How do I use a promo or coupon code? On the checkout page, enter your offer code in the "Coupon Code" box and click "Apply" to update your order subtotal. Limit one promo or coupon code per order. Due to the extremely low prices we offer for Littmann and Welch Allyn diagnostics, we regret that you cannot use a discount coupon to purchase those products. Are there exclusions to promotions and coupons? Free shipping offers apply to the 50 US states only. The following manufacturers have imposed restrictions on retailers that prevent us from including some or all of their products in select sale events: ADC, AliveCor, Asics, Barco, Barco One, Bodimetrics, C3, Carhartt, Cherokee, Cherokee Workwear, D-Eye, Dansko, Dickies, Eko Devices, Elle, EON, Grey’s Anatomy™, Healing Hands, Heartsoul, IguanaMed, Jockey, Klogs, Koi, Landau, LifeThreads, Lynx, Maevn, MDF, Med Couture, Nurse Mates, Pure Soft, Red Panda, Reebok, Riester, Sanita, Skechers, Smitten, Softwalk, Spring Step, Swiftwick, UltraScope, Urbane, Vera Bradley, WonderWink & WonderWORK. The following manufacturers have imposed restrictions on retailers that prevent us from using a coupon on their products: Barco, Bodimetrics, Carhartt, Cherokee, Cherokee Workwear, Dansko, D-Eye, Dickies, Eko, Elle, Jabes, Koi, Littmann, Thinklabs, Welch Allyn & Gift Certificates. Buy One, Get One discounts apply to the item of equal or lesser value. Gifts with purchase are limited quantities applicable to qualifying purchase while supplies last. Only one coupon code can be applied per order. With the exception of special order items, all customers will receive a shipping confirmation email that includes a tracking or delivery confirmation number. To track an order after it has been shipped, click on the "Order Status" icon at the top right-hand corner of the navigation bar. Then enter your order number and email address or billing zip code. You can also track your order via Fed Ex tracking number at https://www.fedex.com/Tracking USPS does not provide order tracking, only delivery confirmations. If you're not completely satisfied with any merchandise you have ordered, you may return it within 60 days of receipt for a full refund of the purchase price, no questions asked! Just visit our online returns page and print our convenient shipping label for $8.98. You can also use your own shipping method to return your items at your own cost. Want to exchange it? No problem! Just complete your return online and at the end of the process we’ll offer you the ability to select your replacement items which will be shipped to you for free. We'll send your exchange order right away and once your return is received, we will process your refund. If you have additional questions, please call us at 1-800-372-2201. Laundered garments and footwear showing visible wear are not returnable unless they are defective. Embroidered garments and engraved equipment are not returnable unless we have made an error in embroidering your garment or engraving your equipment. All items must be in their original condition with their original packaging, instruction manuals, warranties, and tags. Original shipping/processing charges are not refundable. We will, however, exchange items with no additional shipping/processing charges. Visit our online returns page where we also provide the option of an easy exchange once you complete the return process. We will begin processing the order as soon as it is received. Please include an email address to receive an order confirmation and tracking information on your shipment. What forms of payment does allheart accept? allheart accepts payment by Discover, Visa, MasterCard, and American Express for online orders. When ordering by mail or fax, we accept payment by the aforementioned credit cards as well as by check or money order. If you are purchasing with a debit card, it is standard procedure to request a pre-authorization from your bank before your order is processed. The pre-authorization will confirm that your bank account has sufficient funds available to cover your order purchase. The funds are not actually removed from your account until we ship the order to you. You may see both the pre-authorization and the charge on your account, but this is not a duplicate charge. The pre-authorization will be removed within a few days, depending on your bank. At that time, you will have only been charged for the item(s) that have been shipped. allheart will charge for the processed in-stock items, plus the entire amount of shipping & handling costs. Payment for any backordered items will be charged upon delivery. You will not be billed any additional shipping fees for backordered items. Does allheart charge sales tax? Sales tax will only be charged if you are shipping to a state where there is an allheart location or other presence. allheart.com is not required to, and does not, collect Colorado sales or use tax. Under Colorado law, purchases are not tax-exempt merely because they were made over the internet or because a seller is not required to collect Colorado tax. Colorado law requires Colorado purchasers to review untaxed purchases and, if any tax is owed, file a Colorado use tax return and pay any tax due. Visit Colorado.gov/Tax/Usetax for information. For shipments into Canada, allheart collects the VAT and duties based on your order, so you know the charges before you buy and avoid any additional import charges being collected on delivery. In the "Other Information" section at the bottom of the Checkout page, enter your offer code in the "Promo Code" box and click "Apply" to update your order subtotal. Limit one promo or coupon code per order. Due to the extremely low prices we offer for Littmann and Welch Allyn diagnostics, we regret that you cannot use a coupon to purchase those products. How do I use a gift certificate code? 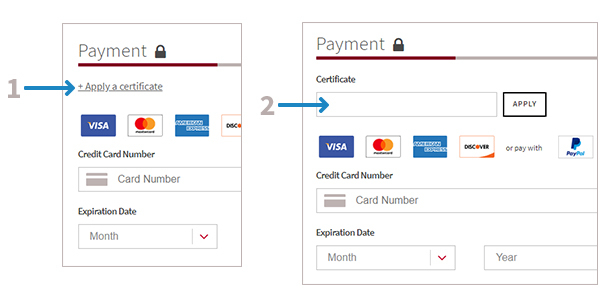 In the Payment section of our Checkout page, click "Apply a certificate" and enter your code in the " Certificate" box and click "Apply" to update your order subtotal. Multiple gift certificates can be used on a single order. What if an item is not in stock? On occasion, demand for a product will exceed the quantity in stock. If this is the case, you will see a message about the availability of that item when you hit the Add to Cart button. In addition, if you order an item that is currently out of stock, we will notify you by e-mail that the product is backordered and let you know when it is expected. We will often give you the option of replacing the item with a different one (i.e. a different color). If you have ordered multiple items, in-stock items will be shipped immediately via your requested shipping method, so as not to delay your entire order. Backordered items will be shipped at our cost at no extra charge to you. Note: If you are using e-mail filters and/or blockers, be sure to add allheart to the safe sender list in your address book to ensure that you receive our notifications and updates. Please remember that in-stock items ordered before 2:00 PM ET Monday-Friday (excluding holidays) will ship the same business day! If you need to cancel or change an order, please call us at 800-372-2201 during regular business hours or email customerservice@allheart.com as soon as possible with your request. We use automated order processing and warehouse systems to provide you with the fastest service possible, so we may not be able to cancel or modify your order before it is processed. Cancellation or change of an order usually involves return of merchandise or additional shipments. We apologize for any inconvenience. Please refer to our returns policy for additional information. How do I order the correct size? You can find the size chart for any item on the product page. Simply click on the measuring tape to open the size chart for the item you are viewing. Can I personalize my purchase? Yes, allheart can customize your purchases with personalized embroidery or engraving. What items are available for embroidery? allheart offers embroidery on solid scrub sets, solid tops, solid jackets, t-shirts, lab coats, select blood pressure devices, select bags, and nurse kits. You can add up to three lines of embroidered text and/or an embroidered emblem. Lettering is available in 13 thread colors and multiple block and script font options. What items are available for engraving? allheart offers engraving on select allheart and Littmann stethoscope heads and/or binaural tubes. Engraving is also offered on stethoscope heads from other top brands, as well as select reflex hammers, scissors and name tags. Engraving is available six font options. How much does it cost to embroider an item? How much does it cost to engrave a stethoscope? When will I receive my personalized items? Please allow an additional 2-4 business days for delivery of embroidered or engraved items. Can I return or exchange personalized items? Unfortunately, allheart cannot exchange or refund any items that are embroidered or engraved unless the item is defective. Please verify all your instructions before submitting your order. What if allheart is unable to accept my order? Please note that allheart may be unable to accept or may need to cancel certain orders. We reserve the right, at our sole discretion, to refuse or cancel any order for any reason. We cannot complete any personalization or gift card messages that contain profanity or we deem as inappropriate. In this event customer service will contact you to request an alternate message. Situations that may result in your order being canceled include limitations on quantities available for purchase, inaccuracies or errors in product or pricing information, or problems identified by our credit and fraud avoidance department. We may also require additional verifications or information before accepting any order. allheart will contact you if all or any portion of your order is canceled or if additional information is required to accept your order. If your order is cancelled after your payment has been processed, allheart will issue a credit to your payment method in the amount of the charge. Is shopping at allheart secure? You can feel completely secure when ordering from allheart. All online transactions at allheart are handled with an industry-standard technology called Secure Sockets Layer (SSL), which encrypts (or encodes) sensitive information before it is sent over the Internet. We do our best to accurately represent the appearance of the products we sell on our online store. However, please keep in mind that if your monitor color settings have been changed or are not set to the default standard settings, a product's true colors may not appear as they should on your screen. Does allheart have a catalog? We do not publish a printed catalog. Instead we maintain a "live" catalog on the internet. This way you have access to the newest products, "Everyday Low Prices", and a selection that surpasses any mail order catalog! How do I place an order for a group? What if I am unable to call during Customer Service hours? No problem, just complete the contact form and a Customer Service representative will contact you. Do I have to place an order by phone? Speaking by phone with a Customer Service representative is the most efficient way to complete your group order, but your representative can also communicate with you by email. Just complete the contact form we'll help you find the best possible ordering process to suit your needs. What information do I need to have ready when I talk with Customer Service? You don't have to make any preparations for your first conversation by phone or email. You will be assigned a dedicated account specialist who will answer your questions and guide you through the entire process from purchase to delivery. Are there discounts for group orders? There are volume discounts and special offers available for qualifying orders. Your dedicated account specialist can tell you about any discounts that would be available to you. Does the 110% Price Match Guarantee apply to group orders? Does allheart's Return Policy apply to group orders? Are Custom Logo and Personalization Services available for group orders? Yes. Your Account Specialist can provide details on the process and pricing. For custom logo application there is an additional fee of $10-$15 per garment and there may be a charge for custom logo digitization. How does the allheart 110% price match guarantee work? If you find a lower price on an identical item at an authorized retailer and show us proof of that pricing within 7 days of your purchase from allheart, we will match the price PLUS give you an additional 10% of the price difference. allheart will make a one-time price adjustment when the price of merchandise purchased from allheart is marked down within 7 days of the original purchase. An additional 10% will not be included in the adjustment. Can I apply this guarantee to a similar product in a different style, size or color? No, the item for comparison must be exactly the same style, color and size and you must be able to order the product. Does this guarantee include items that are personalized? The 110% price match guarantee applies to the total price of an item with personalization. Does this guarantee include reconditioned or refurbished items? No, the item for comparison must be new and factory sealed. We will not match the price of a reconditioned or refurbished item. Are clearance, closeout, or liquidation sales included in the price match guarantee? No, pricing on items included in clearance, closeout or liquidation sales do not qualify for the price match guarantee policy. What if I use a coupon at another retailer's site, can I use the price after the coupon is applied for comparison? Yes, the price after applying the coupon is valid for comparison, as long as the product is specifically included in the coupon offer. Are tax, shipping and handling charges included in the prices that are being compared? No, the 110% price guarantee applies to the product prices advertised by allheart and other authorized retailers excluding tax, shipping and handling charges. How do I contact allheart to redeem this guarantee? Contact us via e-mail customerservice@allheart.com or phone 1-800-372-2201 within 7 calendar days of your purchase. How will the difference plus 10% be returned to me? We will apply the credit back to the credit card used on your purchase or send you a check if you purchased with a check. What do I need to do to claim the 110% price match guarantee? The date of your order and your order number. A screenshot of the product page from another authorized retailer's site with the advertised retail price. An image of the advertisement showing the retail price. When will I get my credit or check? Upon review and confirmation, we will issue credit back to your credit card or send you a check in the amount of 110% of the price difference. Please allow 14 days for processing. allheart reserves the right to independently confirm the reported lower price. If we are unable to confirm the lower price, we will be unable to honor the discounted price and the 110% guarantee. Which items qualify for the 110% price match guarantee? All products sold by allheart. Who is considered an "authorized retailer"? Any United States based retailer who is authorized by the vendor to sell new, factory-sealed product in the USA. The web site should have a .com or .net or .USA in the title. allheart ships via FedEx SmartPost Ground delivery service. This service utilizes both FedEx and the US Postal Service for handling. In most circumstances, your package will be delivered via the US Postal Service. All standard delivery packages can be tracked at https://www.fedex.com/tracking. All P.O. Box addresses are sent via FedEx SmartPost. FedEx Premium Ground utilizes the FedEx ground delivery network from door to door. This service will deliver your package to you faster than any other ground service. * 18% Duties & Taxes will be added to your order at the time of purchase. This amount will be shown in the text field on your order confirmation. Canadian Customers: By ordering goods on this website, you hereby authorize a licensed Canadian customs broker chosen on your behalf to act as your agent, and to transact business with Canada Border Security Agency (CBSA) to clear your merchandise, account for applicable duties and taxes, and if required, to return the merchandise to the merchant and to prepare and submit refund claims on your behalf for any merchandise that is returned. In the event of a return, CBSA will send any refund of duties and taxes that were paid on the returned merchandise to the broker and you will obtain the refund directly from us. In this connection, you also authorize the customs broker to endorse any refund cheque issued by CBSA in your name, so that we may process the reimbursement. Mexico, Japan, Italy, and Netherlands: Add 06 US Dollars per line plus the rate below. All Other Countries: Add 010 US Dollars per line plus the rate below. * International customers are responsible for paying any additional taxes, duties, or customs fees charged by their local government. Additional shipping charges may also apply in some cases. Most in-stock, non-personalized orders ship in 1 business day. Please allow 2-4 additional business days for personalization. Depending on the shipping method selected, your order should arrive in 1-8 business days. For your convenience, allheart ships via FedEx economical SmartPost Ground delivery service. This service utilizes both FedEx and the US Postal Service for handling. In most circumstances, your package will be delivered via the US Postal Service. All PO Box addresses are sent via FedEx SmartPost. Most orders shipped via FedEx SmartPost will be delivered within 8 business days from your day of order. Business days are Monday—Friday, excluding holidays. FedEx Ground utilizes the FedEx ground delivery network from door to door. This service will deliver your package to you faster than any other ground service. Most orders shipped via FedEx Premium Ground will be delivered within 5 business days from your day of order, if placed by 2:00pm ET. Business days are Monday—Friday, excluding holidays. **Not available when shipping to P.O. Boxes, Alaska, Hawaii, or US territories (Puerto Rico, Guam, Virgin Islands). Orders shipped via 2-Day Air will be delivered on the 2nd business day after your day of order, if placed before 2:00pm ET. Business days are Monday—Friday, excluding holidays. Orders shipped via Next Day will be delivered on the 2nd business day after your day of order, if placed before 2:00pm ET. Business days are Monday—Friday, excluding holidays. If your order shipped more than 30 days ago and you still have not received it, please e-mail customerservice@allheart.com or call 1-800-372-2201. Do any items require additional delivery time? Engraved nametags may require an additional 10 days to process. Some large patient-monitoring equipment may take an additional week to deliver. Backordered items will be shipped as soon as they become available. You will be notified within 24 hours if there is any delay to your order. How are orders shipped to Alaska, Hawaii, U.S. territories, APO and FPO addresses? Shipments to Alaska, Hawaii, US territories (Puerto Rico, Guam, US Virgin Islands), APO and FPO addresses are delivered via USPS. Premium Ground Service and 2-day delivery are NOT available to Alaska, Hawaii, US territories (Puerto Rico, Guam, US Virgin Islands), APO and FPO addresses. Does allheart ship to Canada? By ordering goods from allheart, you hereby authorize a licensed Canadian customs broker chosen on your behalf to act as your agent and to transact business with the Canada Border Security Agency (CBSA) to clear your merchandise, account for applicable duties and taxes, and if required, to return the merchandise to the merchant and to prepare and submit refund claims on your behalf for any merchandise that is returned. In the event of a return, the CBSA will send any refund of duties and taxes that were paid on the returned merchandise to the broker and you will obtain the refund directly from us. In this connection, you also authorize the customs broker to endorse any refund check issued by the CBSA in your name, so that we may process the reimbursement. What if part of my order is backordered? If you have ordered multiple items, in-stock items will be shipped immediately via your requested shipping method, so as not to delay your entire order. If you have ordered multiple items for international delivery, the order will not ship until the entire order is fulfilled. Payment for any backordered items will be charged upon delivery. You will not be billed or charged for any additional shipping fees for backordered items. What is allheart’s return policy? What if my item is defective, broken or needs repair? For repair, maintenance, and warranty service that is covered by a manufacturer's warranty, please contact the manufacturer directly. For 3M Littmann products, please click here for further information. All items returned must be in their original condition with their original packaging, instruction manuals, warranties, and tags. Items must be returned within 60 days of receipt. If an item was ordered as a set, it must be returned as a set. Please allow 14 business days to process your return. Visit our online returns page for further details on completing your return. Where can I get a Return/Exchange Form? For domestic returns, please visit this page. For international returns, please fill out the form located here. Are there any items I cannot return or exchange? Due to health codes, support and fashion hosiery may not be returned or exchanged except in the case of a manufacturer's defect. Opened software, electronic books, and books including software that has been opened may not be returned or exchanged except in the case of a manufacturer's defect. To review your account information, click on "My Account" in the main menu. Enter your email address and password to access your allheart account. How do I subscribe/unsubscribe to allheart’s email list? Subscribing to allheart’s email list gives you access to exclusive offers, a special birthday treat, and first access to new products and sales. Customers are automatically subscribed to our email list when making a purchase from allheart. If you'd like to subscribe without making a purchase, enter your e-mail address in the Sign-Up & Save section on the footer of our website. To unsubscribe from our mailings, click on the "unsubscribe" link located at the bottom of any of our emails. What is the warranty on my Littmann Stethoscope? Your 3M™ Littmann Stethoscope comes with the Littmann Warranty - if a material or manufacturing defect occurs during the warranty period, Littmann will repair it for free of charge, except in the cases of obvious abuse or accidental damage. You can reach Littmann by phone at 1-800-292-6298 or by email at healthcare@3m.com. If your warranty has expired, allheart has replacement parts and accessories here. What is the warranty on my Welch Allyn Stethoscope? Your Welch Allyn stethoscope is backed with a warranty that typically exceeds competitive models. Should a material or workmanship defect be discovered, Welch Allyn will repair or replace the product at no charge. This warranty does not cover damage in shipment or failure caused by tampering, obvious carelessness or abuse. If your warranty has expired, allheart has replacement parts and accessories here.